Welcome to day 28 of my 31 Days of ReSharper. Today, I’ll touch on a couple more refactorings (besides Introduce Parameter, discussed yesterday) that you can use in conjunction with Extract Method. ReSharper won’t always let you extract a static method (e.g., if the code references instance fields or methods). 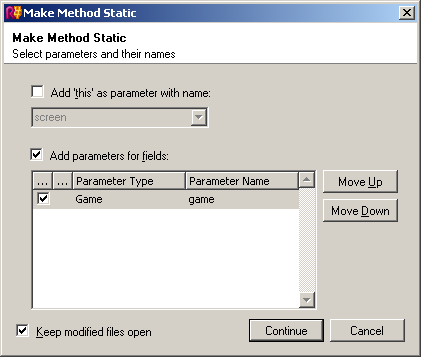 But you can get there in two steps, by first extracting the method, and then using the Make Method Static refactoring. I haven’t used this refactoring much, so I won’t go into details. I just wanted to note that it’s there. ReSharper doesn’t have an “Extract Property” refactoring. But you can get there in two steps: first you extract a method, and then you use Method to Property. There’s also a Property to Method refactoring, if you ever need to go the other way. Welcome to day 26 of my 31 Days of ReSharper. Ever had three functions that all take the same parameters, but each one in a different order? 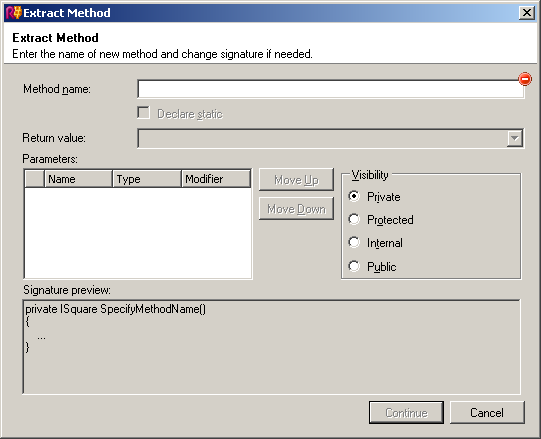 If so, Change Signature is the feature for you. Rename the method. If you select Delegate via overloading method, it will even put in a method with the old name, that does nothing but call the new one. In case that’s ever useful. Add a parameter. You must specify a default value, which is what will be passed at all the call sites. But sometimes you don’t want to pass a constant value every time, in which case, see the next section. Rename a parameter. Alas, ReSharper does not provide variable-name suggestions here, even if you press Ctrl+Space. In all of these cases, ReSharper takes care of updating all the call sites. When you add a new parameter, ReSharper wants to keep your code compilable, so it needs to modify all the call sites that already call this method. That means it needs something to pass. This is a required field; you have to specify something to pass from all the call sites. 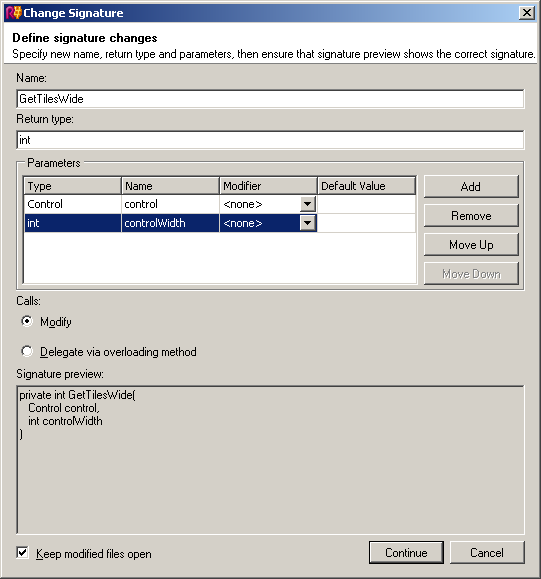 Don’t use Change Signature; manually add the parameter instead. Then the compiler will take you to all of the call sites — probably. (I’ve been bitten by this one when there turned out to be other overloads.) Not recommended in any but the simplest of cases; that’s why we have tools to do this stuff for us. Use a default value, and remember to go back and change it. Also not recommended. Human memory is not that good. That’s why you’re using ReSharper in the first place. You should only use a default value like null if it really is the most reasonable thing to pass. Use a nonsense expression, like asdfjkl, that won’t exist at any of the call sites. ReSharper will let you do this, but (no surprise) you’ll end up with non-compilable code. This is actually good, in this case: it guarantees that the compiler will take you to every call site, where you can make a case-by-case determination of what to pass in. Use an expression that you hope will work most places. If you’re passing a Foo object, you can just type Foo as the default value, in the hopes that most of the call sites will be on classes that already have a Foo property. We’ve often had decent luck with this one. Use Introduce Parameter instead. If you can use Introduce Parameter, it’s better than Change Signature, because Introduce Parameter will do the right thing. But it only works if you can express the new parameter in terms of things the method knows about. Welcome to day 24 of my 31 Days of ReSharper. Yesterday I talked about ReSharper’s Introduce Variable refactoring. Today’s topic is Introduce Field. 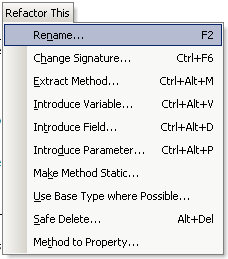 It does the usual variable name suggestions (which follow the naming conventions you specify in ReSharper Options). 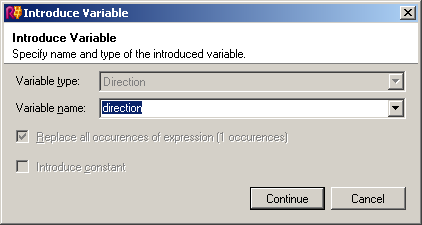 Like Introduce Local Variable, it has a Replace all occurrences of expression checkbox. But because Introduce Field affects an entire class, the blue highlights, and the blue stripes in the color bar, become more useful in seeing how many places the expression will be replaced (although the fact that they won’t go away is still annoying). Not much more to be said about the basic settings. The options speak for themselves fairly well. I sent in a feature request to add “Initialize in [SetUp] method” to ReSharper, but they closed it as “Won’t Fix”, claiming that it could be implemented as a plug-in. If that’s true, they have got a long way to go on the documentation for the ReSharper plug-in API, because they don’t have any refactoring samples at all. It doesn’t even look like they’re planning to write any; they don’t have a section for them. So if anyone wants to write a ReSharper plug-in that adds a radio-button choice to an existing dialog box, and uses that new choice to change the behavior of an existing refactoring, I’ll just wish you the best of luck right now. Use Introduce Field, and select “Current member”. Cut the assignment that ReSharper just generated, and paste it into your [SetUp] method. Not that hard, really. Just irritating. They’ve spoiled me by making everything so easy, that it’s frustrating when they take something I do all the time and flat-out refuse to make it as easy as it should be. Welcome to day 23 of my 31 Days of ReSharper. Today, and for the rest of the 31 days, I’ll be talking about ReSharper’s support for refactoring, which is much improved over the handful of refactorings that ship with Visual Studio 2005. ReSharper has a targeted context menu for refactoring. It contains only the refactorings that make sense at the current cursor position, or based on the current selection. You invoke it with Ctrl+Shift+R. This menu contains other refactoring commands, and some of them have their own keystrokes defined. (They’re full-fledged Visual Studio commands, so you can add or change the keymappings.) You may learn some of those other keystrokes, if there are refactorings that you use often. But I really like the low cost of entry. All you need to remember is Ctrl+Shift+R. Introduce Variable creates a new local variable, and initializes it to the selected expression. Then it replaces the selected expression with a reference to the new variable. Variable type. I don’t think I’ve ever seen this combo box enabled; it’s always locked in on the exact type of the expression. If you want to use a base type instead, you’ll have to introduce the variable first, and then change the type. Variable name. ReSharper’s variable name suggestions kick in here, of course. One suggestion is filled in, and you can see the others by dropping down the combo box. Replace all occurrences of expression. Since you’re introducing a local variable, this only replaces occurrences within the current method. If the same expression shows up more than once, then you probably want to check this option most of the time; but it can change your code’s behavior, through side effects and aliasing and whatnot, which is probably why this option isn’t checked by default. Introduce constant. This could have been a separate refactoring, but they rolled it into Introduce Variable. 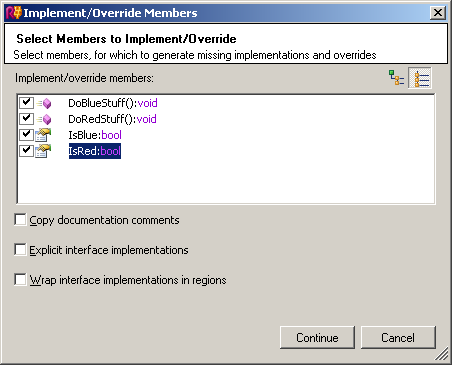 This checkbox is only enabled if the expression can be evaluated at compile time. When you bring up this dialog, if the expression shows up more than once in your method, ReSharper will highlight all the usages in blue. It will also show blue tick marks in the color bar. Update: I didn’t realize it when I first wrote this, but the blue highlight also sticks around after you click OK. So no matter what you do, if you bring up this dialog, you need to remember to press Esc after you close it. One extra, needless step, every single time. Isn’t ReSharper supposed to be there to make things easier, and make common tasks take less time? Grumble. So anyway. It took me a couple of months, but I eventually found an easy way to dismiss all the blue: just press Esc. This is a good thing to know, because otherwise, it’s pretty stubborn: until you press Esc, that highlight is going to stick around until you either close the file or delete the code. Note: Tomorrow’s article isn’t quite done yet, and I’ll be out of town this weekend. So tomorrow’s article will get posted on Sunday. Welcome to day 22 of my 31 Days of ReSharper. So I’ve covered Alt+Enter, which is all about fixing code. Sometimes it does this by generating new code (e.g., when you change a class to implement an interface, and Alt+Enter has to generate method implementations), but the focus is on fixing errors and warnings. Today I’ll cover Alt+Ins, which is specifically geared toward generating code. When you press Alt+Ins, a menu appears, showing all possible code-generation commands. This menu always shows all of its commands, and grays out the ones that aren’t available (as opposed to other ReSharper menus that only show the available items). Alt+Ins generates code within a class, so if you press Alt+Ins when the cursor isn’t inside a class, everything will be grayed out. Every one of the Alt+Ins commands brings up a wizard. Typically, the wizard pages will contain lists where you can select things (fields, for example) that you want taken into consideration by the generated code. There are two types of lists in these wizard pages: there’s the checked list, and the regular list. The checked list, as seen above, has checkboxes next to each item. It seems to be used when you can select zero or more items (i.e., when “no selection” makes sense). The regular list has no checkboxes; you make your selection by selecting one or more items in the list. It’s a standard multiselect listview, so you can Shift+click and Ctrl+click to select multiple items. The regular list seems to be used when you must select at least one item, although this isn’t actually enforced. You can get some amusing results by Ctrl+clicking the only selected item to de-select it, and then moving on through the wizard. If you want to select everything in a list, it’s easy. In the checked list, press Ctrl+A and then Space. In the regular list, just press Ctrl+A. This command generates a parameterized constructor to initialize some or all of the fields on your class. It shows a checked list where you can select which fields you want to initialize. Multiple constructors. If the base class has multiple constructors, there will be a second wizard page that asks you which constructors to call. 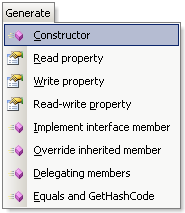 If you select more than one, then more than one new constructor will be generated. Dumb. There’s no checking to see whether constructors already exist. If you tell it to generate a constructor with the same parameters as one you’ve already got, it will happily do it, and then give you red squigglies because the code doesn’t compile. It’s one of only two Alt+Ins commands that don’t check to make sure they’re generating good code. There are three commands: Read property, Write property, and Read-write property. They all work the same: they ask you which fields to generate properties for, and then they go do it. This one is smart. 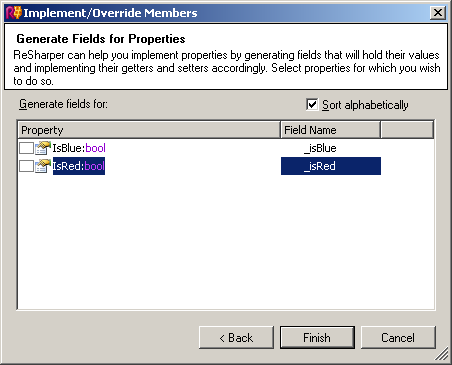 If you’ve already created some properties, then those fields won’t be selectable in the wizard. 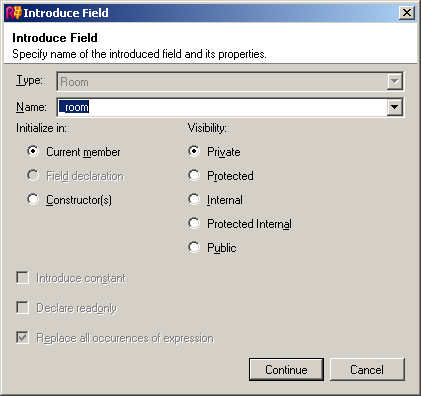 If you’ve already created properties for all of your fields, then all of the property-generation commands in the menu will be disabled. This one is actually identical to using Alt+Enter to Implement Members, except that it only shows interface members, not abstract methods. This is, again, just like Alt+Enter to Implement Members, except that (a) it doesn’t show interface members, and (b) it shows virtual (non-abstract) methods as well as abstracts. Equals() and GetHashCode() will be shown in this list, but keep in mind that there’s a cooler way to do those — use the “Equals and GetHashCode” command in the Alt+Ins menu, described below. In this example, I delegated the Length property and the GetFoo() and DoSomething() methods to the _inner field. The Generate Delegating Members wizard makes this the matter of a few clicks and can do several members at once, and it’s subject to a lot less human error than doing it by hand. You can delegate to any field or property (so you can delegate to something that’s lazy-initialized, for example). First you select the field or property, and then on the second page, you select the members to delegate. Like Generate Constructor, this one is also dumb. It will let you delegate the same method signature more than once, which will lead to non-compilable code. It’s not common to need to override Equals and GetHashCode, but when you do, I think some automated assistance would be quite welcome. First the wizard asks you which fields you want to compare in Equals(), and then it asks which of those fields you want to use in calculating GetHashCode(). It’s smart enough to know that if a field isn’t used in determining equality, then that field had better not be used in calculating the hash code (i.e., if you don’t check a field on the first page, then it’s not available on the second page). If any of the fields you select are reference types, there’s a third wizard page, which asks if there are any fields that can be assumed to be non-null. If so, it can simplify the implementation of GetHashCode(). Here’s an example of the resulting code. _name is assumed to be non-nullable; _address is not. Welcome to day 19 of my 31 Days of ReSharper. Visual Studio 2003 and 2005 both had features for helping you implement interfaces. VS2003’s features were a lot more finicky. VS2005 was much better. ReSharper is better yet. Let’s take a look. When you create a new class, and add : IFoo to its declaration, you’ll get a red squiggly, because you now have code that won’t compile (because there are no methods on your class to satisfy that interface). When you put the cursor on the squiggly code, you’ll get a red light bulb, and when you press Alt+Enter, you’ll see the Implement members quick-fix. The same thing happens if you have a non-abstract class, but its parent class has abstract methods. But in this case, there’s a second quick-fix: Make ClassName abstract, which I’ll ignore since it’s pretty self-explanatory. Note that if your descendant class is already marked abstract, you won’t get a red squiggly for your unimplemented abstract methods, since they aren’t errors. That means you don’t get a quick-fix. ReSharper still has a way to automate these overrides, though, which I’m currently scheduled to cover on Thursday (Day 22). The first page of the wizard lets you select which members you want to implement. Everything is selected by default. It would be silly to uncheck anything in the list, because then you’d be left with still-unimplemented interface members or abstract members, so your code still wouldn’t compile. Note the toolbar buttons in the top right, above the list. These toggle the list between a tree, where everything is grouped by interface, and a flat list, which is sorted alphabetically. This only affects the way they’re displayed in the wizard. ReSharper will still generate the members in any old order it feels like. There are three options down below: Copy documentation comments, Explicit interface implementations, and Wrap interface implementations in regions. They’re fairly self-explanatory, and I have yet to use any of them, so I won’t cover them further. On to the second page. The second page is where ReSharper’s version becomes much cooler than Visual Studio’s, because you can automatically create backing fields for any or all of your properties. It will add the fields (following the naming conventions you’ve set up in ReSharper Options), and will read and write them from the property getters and setters. Methods, as well as any properties you don’t check in this list, will get placeholder code that throws a NotImplementedException. If you want to check all of the fields in the list, press Ctrl+A and then Space. Then you click Finish, and it generates the code for you. Note: the “Sort alphabetically” checkbox on page 2 is the same setting as those toolbar buttons on page 1: if you check “Sort alphabetically”, you get a flat sorted list, whereas if it’s unchecked, you’ll get the tree. It’s actually just one option for both pages (changing it one place will change it in the other), although they present it differently on the two pages for some unknown reason. So, there’s Implement Members. Simple but useful. The only option it’s missing is to add a constructor that sets initial values for some or all of those backing fields. There’s an automated way to do that, too (also slated for Day 22), but it’d be nicer if there was an extra wizard page for it. Still, the ability to just implement everything all at once, and create backing fields at the same time, is pretty sweet.